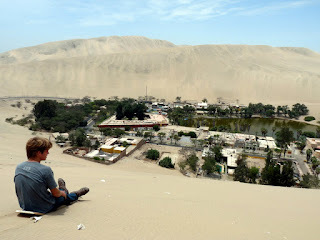 Huge mountains of sand loom over Huacachina, a palm-fringed oasis in the middle of nowhere which makes a living from the apparently foolhardy exercise of sandboarding. 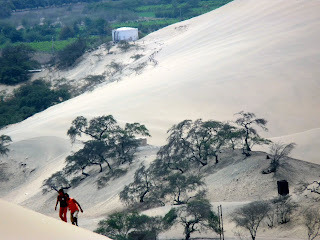 This involves climbing up the dunes with a board in hand, getting to the top, sitting or standing on the board and then coming back down again. This morning we rented sandboards and set off on what we were told was the easiest piste to climb. Christ, what work! We traipsed and traipsed and traipsed, and then traipsed on some more. We looked back down. About five metres gained. "Will we go here?" I gasped with what breath I'd left. We went on. Sand slipping underfoot. Twenty steps to climb one. Huffing and puffing like huffy-puffy things. Sun beating down without pity. Gulping and gasping, leaden legs heaving and straining up the sliding sands. Jelly legs at the top. Finally we'd made it! Enough energy to flop down onto the board and descend in one minute what it took 45 minutes to climb. "Weeeeee!" you'd say if you had any energy left. We were still gasping at the bottom. No energy for anoher go.